I knew precious little about T.E. 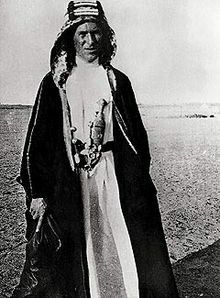 Lawrence (Lawrence of Arabia) prior to reading the book – I was aware of some scramble for oil-rich territory during and after WWI, but still, not much. I didn’t really connect Lawrence with that mess even. Yes, there was a Lawrence of Arabia movie many years ago, but I didn’t see it. The bits about the Gallipoli incident and the Armenian genocide struck me hard – I know more about the effects of those things – I live near Fresno where there is a very large community of Armenians and I follow the work of Orhan Pamuk. I’ve read a fair amount about Gallipoli from the Australian point of view. 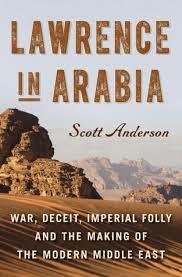 This is a rather favorable review – if that’s what you’re looking for: http://www.spectator.co.uk/books/9150551/lawrence-of-arabia-by-scott-anderson-review/ there are many others. Anderson’s book also covers the lives of William Yale from the US, Aaron Aaronsohn from Palestine, and Curt Prüfer from Germany, all three were prominent players in the area at the time but they weren’t the diplomatic corps folks we usually hear of – Robert Sykes and his peers. But there’s fascinating stuff about all four main subjects, T.E. Lawrence, Curt Prüfer, William Yale and Aaron Aaronsohn who were all working in various capacities in the area. Yale, from old US money, worked for Standard Oil and was over there looking for resources. Prüfer worked for the German diplomatic core in Egypt – he was basically a spy and there is a fair amount written about him – he was a cad. Aaronsohn’s family immigrated to Palestine from Romania in the 1880s and supported Jews buying up the land in the area, using the local Arabs as labor, getting funding from Rothschilds. This was in the years just preceding WWI. Lawrence, the best known, was a Jewish Englishman assigned to the War Office who went to Egypt to negotiate with the Arab chiefs about German connections, the Ottoman Empire and possible independence – or not. Yale, a Standard Oil executive from the US, was pretty much wasting time in Jerusalem because his equipment had been stolen by Turks and Germans and Brits. But he got involved whenever it suited his purposes of gaining access to cheap oil. Then life in Jerusalem got bloody and Yale proved himself quite capable of blackmail, bribery and threats to advance or protect the interests of himself, Standard Oil and the “neutral” US. And Aaronsohn was in Zichron spying and getting pillaged by the Ottomans before he left to persuade other parties – the Americans, the Brits, the Egyptians of his cause to establish a Jewish homeland in Palestine. Except for Prüfer, these men had inter-connected and possibly similar goals – Lawrence wanted Syria free, Yale was looking for cheap oil and friendly suppliers, but also served as a US spy, and Aaronsohn wanted peace in his valley and a safe place for a Jewish homeland. They all dealt as best they could with the powers which they thought would will help them most – or hurt their enemy the most. The Ottoman Empire was falling apart and it seems like everyone wanted to pick up the pieces. The various Arab leaders were fractured but tried to work together under Hussein. Their main goal was to achieve independence. Lawrence cared about that – the others really didn’t. There’s very little about the Turks. My basic problem with the book is that it’s basically boring and Anderson assumed this reader knew more than she did. At the half-way point, when I was still having problems keeping the people and situations straight, I almost threw it away. I’m glad I didn’t. The multi-thread way Anderson tells this story felt very fractured to me and together my lack of knowledge inhibited my really understanding what was going on. It cleared up about 75% of the way through the narrative. If you have some background in the WWI issues of the Middle East this would likely be a great book for you. If not, go get a wee bit of traditional background prior to trying to make sense of the subtleties.